I wasn’t enthusiastic about voting yesterday. Although I took the day off because some of my professors canceled classes, I wasn’t in a rush to get to my polling place. After I spent my morning and early afternoon catching up on assignments, I headed out on that rainy, dreary day, ready to begrudgingly cast my vote for Ralph Northam and the other Democrats on the ballot. I felt hopeless. Gillespie had this election in the bag, at least I thought. Northam’s campaign had been underwhelming, to put it charitably, and I didn’t know anyone who was actually excited to vote for the Lieutenant Governor. Coming off of the surreal and deeply depressing 2016 Presidential election, I was bracing myself for the worst. Thankfully, we now know that I was wrong. Northam defeated his Republican opponent Ed Gillespie by nine points, according to the Virginia Department of Elections. And in more riveting news, Democratic Socialists of America (DSA) member Lee Carter defeated House Majority Whip Jackson Miller in the 50th district. Additionally, Democrat Danica Roem, an openly transgender candidate, defeated Republican and notorious bigot Bob Marshall in the 13th District. This effectively threw the longtime incumbent in the dumpster, where I’m sure he’ll angrily draft anti-transgender bills in silence for the rest of his days. Although it’s important to acknowledge these victories and to celebrate them when they happen, it is equally important to acknowledge the failures of the Democratic Party, especially leading up to this election. After all, this election has been a nightmare for progressives, with Northam lacking in tangible progressive policies and values. 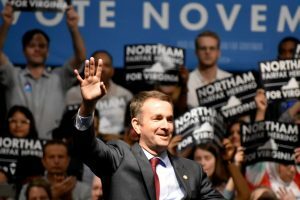 Examining the flaws of Northam’s campaign, and the Democratic Party as a whole will help us understand the demands that people need make of the party going forward. And hopefully, by doing so, we can lessen our chances of having a “too close to call” situation between a racist, fear-mongering conservative and a milquetoast democratic candidate. It is also important to acknowledge the fact that Northam isn’t a progressive. I don’t understand how anyone would consider someone who voted for George W. Bush twice, refuses to take a hard stance against the building of pipelines, and is willing to change his position on something as vital as immigration policy to be a progressive, let alone allow him to get away with branding himself as such. Admittedly, there are policies that Northam believes which separates him from Gillespie, such as his open support of reproductive rights and the LGBTQ community. However, this gets at a key frustration I have with the Democratic Party: When I’m voting for a Democrat, I am often voting for my survival. In every election I have participated in, I’ve had to choose a politician who didn’t have any ideas on how to improve the lives of those struggling under capitalism, yet I supported them because they weren’t interested in taking my rights away. In Northam’s case, I voted for him due to the fact that he supports reproductive rights, and because I wanted one of my best friends to continue to safely transition as a trans woman. Voting out of fear for the safety of a loved one is a terrible reason to want to vote for any politician. It’s cold, callous, and it proves that our “lesser of two evils” two-party system is broken. However, this fear plays right into the Democrats’ hands. The Democratic Party runs on fear. For the past couple of years, their platform has been the fact that they’re not as bad as the Republican Party. But by giving marginalized people no choice, and offering voters nothing but the security of their basic rights, Democrats are leaving us worse off. For example, single-payer health care is becoming an increasingly popular idea among progressives in the United States. However, establishment Democrats don’t want to embrace this fact, opting to die on the hill of the flawed Affordable Care Act instead. If Democrats want to look like they’re serving the interests of the people, they would consider an issue such as single payer, or at the very least, craft another healthcare solution that would serve more of its constituents. Even if we buy into the fact that we must vote for Democrats simply because they will protect certain rights, there’s no way of knowing whether they’ll stay true to their word. After all, if Northam is willing to change his position on sanctuary cities, using the lives of undocumented immigrants as a bargaining chip, what else is he open to changing his mind about? More to the point, what other issues does Northam think he can compromise with Republicans on? Are we ever going to see an anti-transgender “compromise” in Virginia, similar to the one we saw in North Carolina? As a young voter, the only time I felt like I was actually voting for someone I believed in was when I voted for Bernie Sanders in the 2016 Democratic primary. With the Democratic Party undermining Sanders’ popularity and his more progressive policies ever since the primary, and with reports of corruption occurring within the party itself, it’s clear that the Democratic Party does not care about my opinions as a leftist person of color. This is why we need to step up and make our voices heard. This is why pro-sanctuary city protesters interrupting Northam’s acceptance speech last night is not only important, but absolutely necessary. If we don’t push Democrats to care about progressive issues — which are issues that impact a majority of people in the United States — they won’t care about them. It is our job to challenge these politicians, to make it clear that they work for us, and not the other way around. In these tumultuous times, we cannot get caught resting on our laurels. There’s a lot more work that needs to be done, and the only way we’re going to make progress is by getting active, both inside the electoral system, and in progressive organizations outside out of it. I’m glad Ralph Northam won the election. Now, it’s time to keep him in check.